From regular outfit changes to crazy late night parties, London Fashion Week is an intense champagne–fuelled socializing bonanza! From air-kissing to FROW selfies, everyone is trying to look one’s best while eyeing up the new collections on the catwalk, and the key to looking one’s best is having a safe haven in the capital to call one’s home for the 5 day fashion marathon that is LFW! 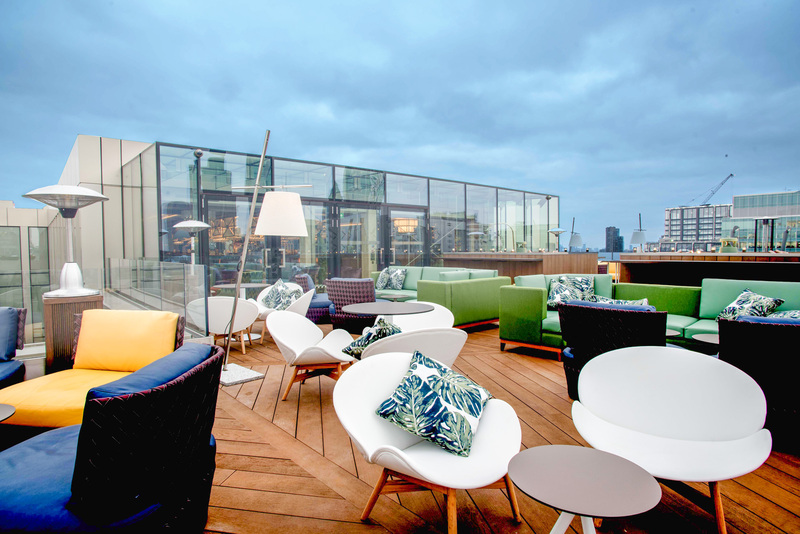 Our haven for the weekend was to be Montcalm Royal London House, where corporate London meets creative London. 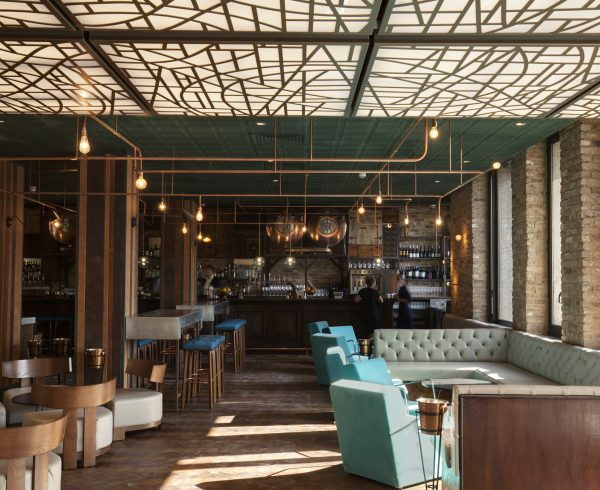 Pulling up to Finsbury Square in our blacked out Mercedes, we were greeted by the smart doorman who welcomed us into the lobby, which is also where Burdock, a luxe but laid-back bar and all-day eatery, is located. We were greeted at check in by the lovely front desk staff, who organized our bags and then showed us to our suite. 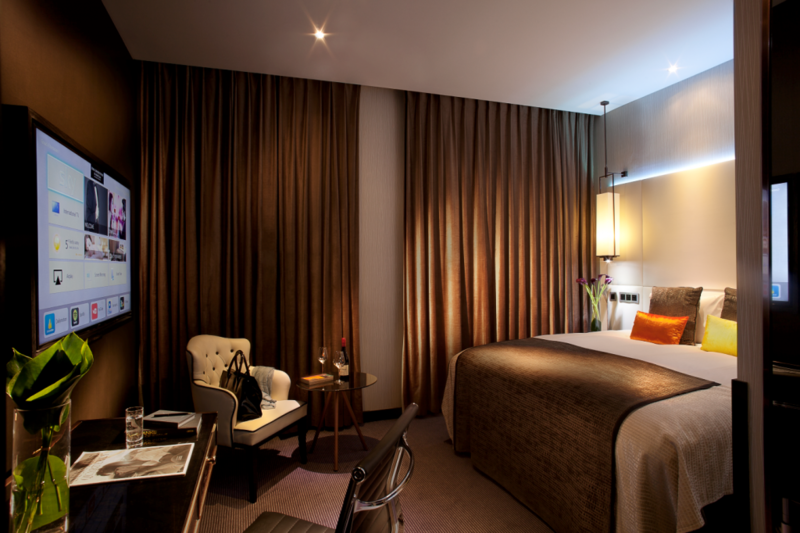 There are 253 spacious, tech-ready rooms in the hotel; some overlook the lawns of Finsbury Square, like our suite. 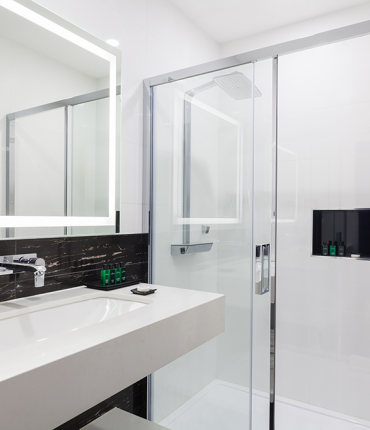 Our suite was quietly tucked away at the end of a corridor, which smelt amazing thanks to Montcalm’s signature scents, and had an interconnecting room with extra bathroom and study area. 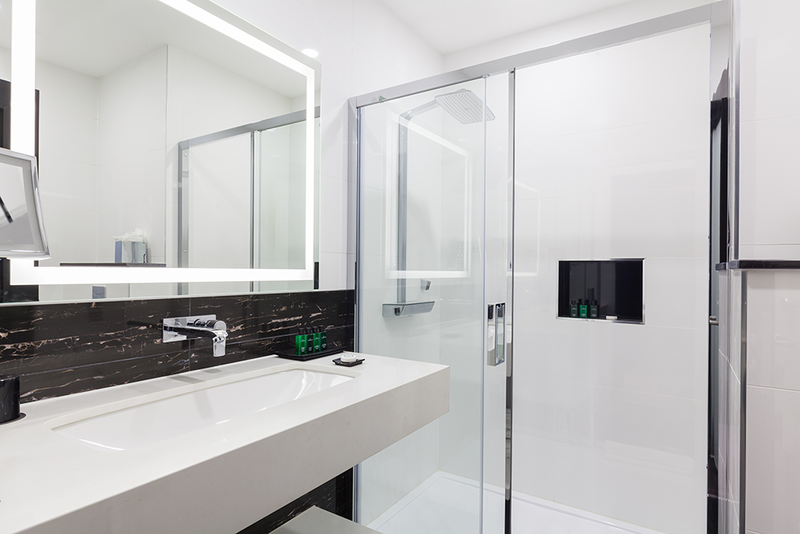 The bedroom was spacious, decorated in muted grey tones, the room was masculine but without being overbearing, the shower room in the main bedroom was also spacious and bright with its all white fittings and fixtures. The extra room, which could be reached through a heavy and sound proofed lockable door, housed a study area, lounge space with a comfy couch that could also serve as a second double bed and a fully fitted bathroom with shower. Eisbär and I were ecstatic having his and her’s bathrooms: a perfect time saving extra that is much needed at LFW when turning things around for shows and parties! Whilst we unpacked the lovely staff of Montcalm delivered us some tasty treats and a bottle of chilled Gavi – the perfect start to a hectic LFW! While sipping on the Gavi we pondered what to wear for the evening’s events; what was great about our suite at Montcalm was Eisbär and I each had a wardrobe and dressing space so we could get ready without getting in each other’s way. Once dressed, we headed down to Burdock, just the spot for fresh smoothies and juices in the morning, small plates and sharing dishes perfect for lunch or dinner, and cocktails and tank beers in the evening. 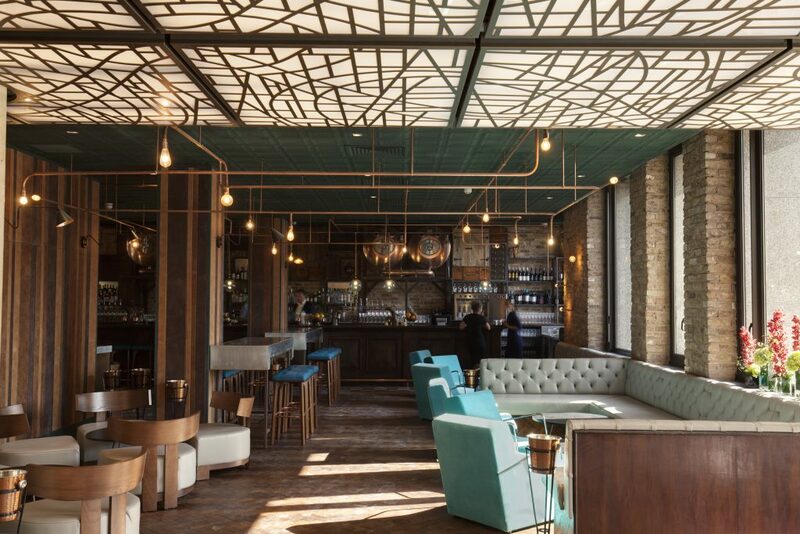 The space is stylish, comfortable and alive with conversation at any time of day; it’s the ideal environment for anything from an impromptu meeting over morning coffee to an intimate dinner and a nightcap. When Eisbär and I went down on a Thursday evening the place was buzzing, from city folks letting off steam over a pint or two to lovers huddled in corners sipping on cocktails – the atmosphere was electric. Eisbär and I took a seat and ordered a couple of G&T’s whilst perusing the menu, we opted for the Octopus, potato, paprika and a side of broccoli and bacon as we did not fancy a heavy meal what with much champagne to be drunk that night! The food was delicious and the service attentive so much so, that later that night when we got back we stopped at Burdock again to enjoy a nightcap and some Kentucky fried skate wings that are 100% gluten free! 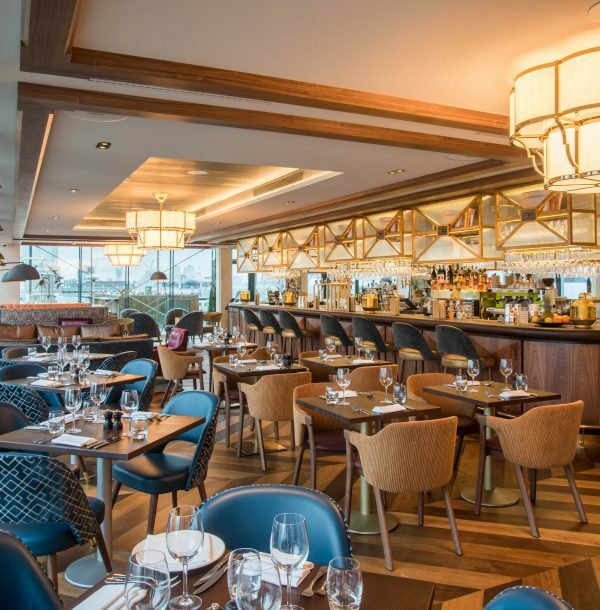 After a blissful night’s sleep in what must be one of the comfiest beds in London, it was time to hit the runways, but not until we had sampled the breakfast at Aviary. 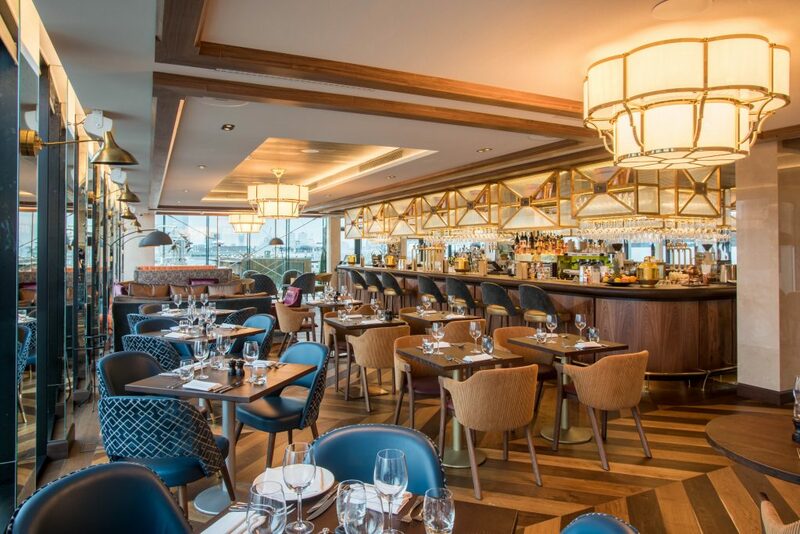 Aviary is an elegant rooftop bar and restaurant that is on the 10th floor of the Montcalm Hotel, with fantastic views of the London skyline, the restaurant serves breakfast, lunch and dinner daily as well as an extensive bar menu. We started with some fresh smoothies, I went for the Wakeup Call containing ginger, carrot, apple, lemon and turmeric, while Eisbär opted for the Burdock Breezer made from kale, coconut milk, banana and pineapple. Aviary offer either a Buffet Breakfast or Continental Breakfast or you can go a la carte with such offerings as Maple bacon butties and Eggs Florentine. Eisbär went for the Buffet Breakfast, while I went for simple scrambled eggs as I was in a rush for my first fashion appointment of the day. The staff was kind enough to put my smoothie in a take away cup so I could whiz across town early without missing out on my fresh juice! After a packed day of runway, presentations and events, we finally got back to the hotel around 3am! I had never been so glad to see a bed! 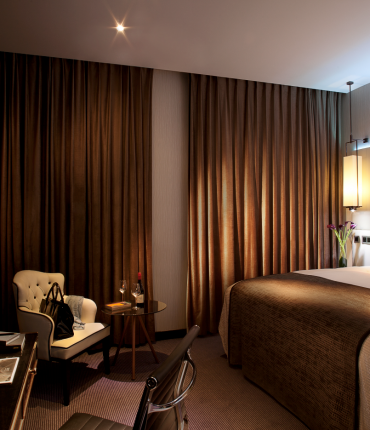 Eisbär and I passed out, whether from exhaustion or over indulging on champagne, I was so grateful for the soft enveloping sheets of the Montcalm. The blackout blinds were perfect to block out the sun come morning, a little worse for wear, there was no rest for the wicked, another day of runway was upon us and luckily for us the Montcalm obliged by organizing a late check out! The last thing one wants to do on a full schedule is have to worry about getting one’s mountains of luggage out of the hotel and on to our next port of call! Once back at the hotel at midday, and after a refreshing shower and change, we made our way to check out. The staff aided us with our luggage to the Uber, whilst we said goodbye to Clive and the staff. It is worth mentioning that Montcalm Royal London House also houses a state-of-the-art spa and gym with Versace swimming pool nonetheless, along with cutting edge meeting spaces for up to 300, which Clive was kind enough to show us before we left. 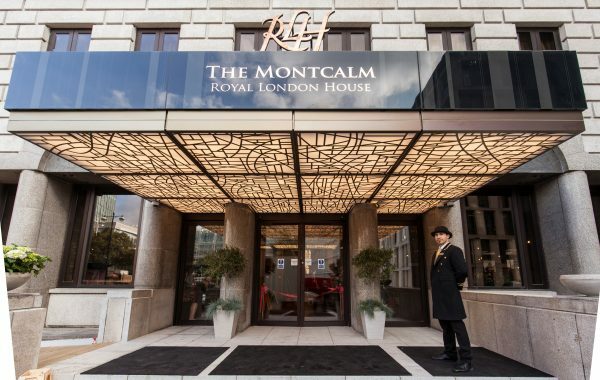 I was a little gutted not to have had a chance to experience the gym and swimming pool, but due to such a packed LFW schedule there was never any time, but this does mean however, that I now have an excuse to return to Montcalm Royal London House! To the south, St Pauls, the Thames and the corporate strongholds of the City. To the north, the creative and digital pioneers of Shoreditch and Tech City. To the west, the land of theatre and the shopping strongholds of the West End. At the heart of it all lies the Montcalm Royal London House, a unique new destination for business travellers, weekenders, urban explorers and now fashionistas! 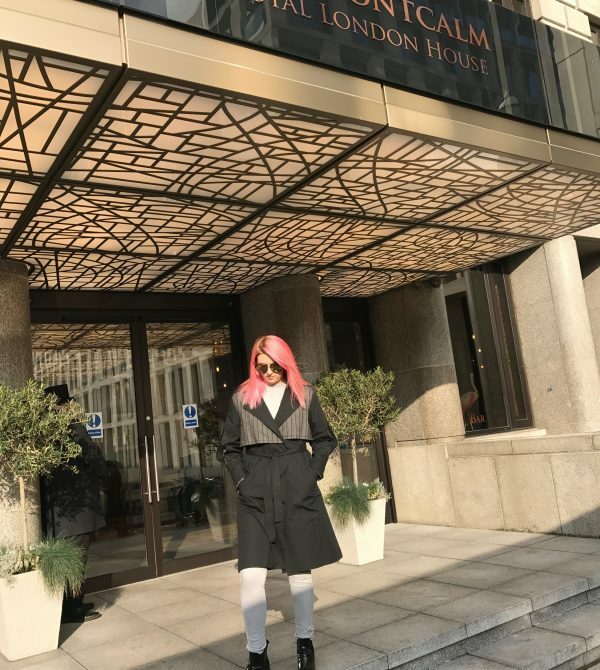 Montcalm Royal London House was indeed the calm after the storm of London Fashion Week and made for the perfect safe haven in the heart of The City, with all mod cons, amazing views and super friendly staff be sure to check in and chill out!